Now that it’s becoming late summer, I’m starting to wonder: is a year-round indoor herb garden possible? I love having a ton of fresh herbs right outside my door and I’m really going to miss them when they’re gone! They’re so delicious and oh so PRETTY. I often get asked about my food photography/styling tips and my best tip is always: Whatever dish you have, smother it in herbs! 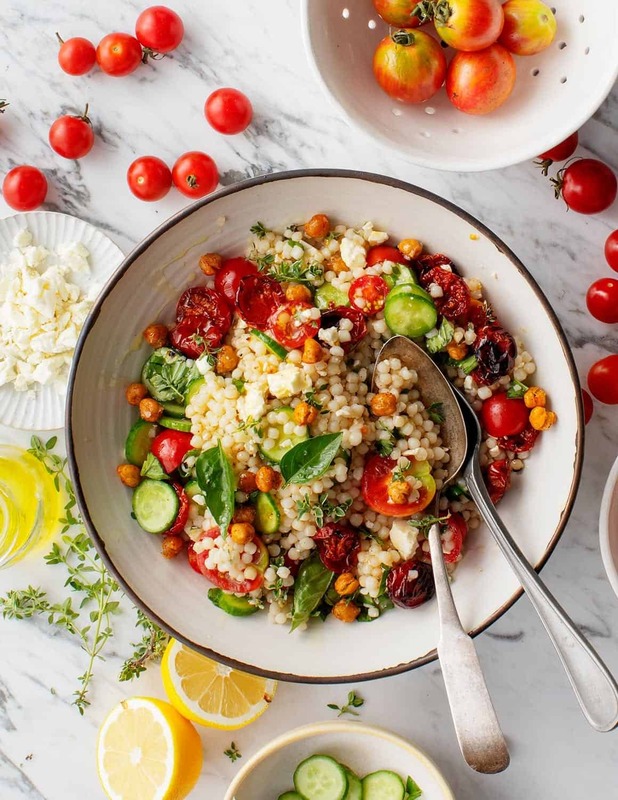 Aside from lots of fresh thyme and basil, this couscous salad recipe is all about the tomatoes. I slow roast half of them and put the other half raw into the salad. Together, the raw and roasted cherry tomatoes make this a sweet, tangy, bursty, crunchy, herb-y gem of a late-summer salad. Cherry tomatoes: The combination of roasted tomatoes and raw tomatoes create wonderful texture and flavor. 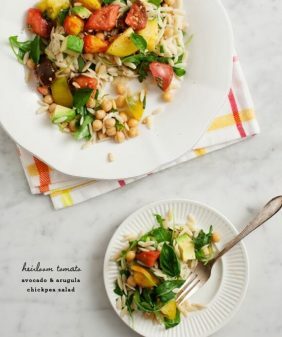 Israeli couscous: I love the large pearls of Israeli couscous in this salad. Roasted chickpeas: These provide protein and a nice crisp bite. Make these ahead of time if you like! A pinch of smoked paprika: This smoky spice highlights the sweet tomatoes. Olive oil & lemon juice: There’s no need to make a separate salad dressing when you have these two ingredients. Garlic: Because tomatoes love it. Fresh herbs: We all love the combination of tomatoes and basil, but the addition of fresh thyme takes this over the top. Cucumbers: These add a fresh, crisp element to the salad. 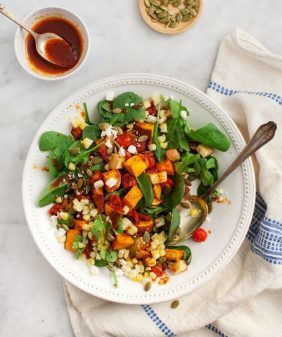 Feta cheese: I love feta’s creamy, salty bite! Skip it if you’re vegan. Roasted cherry tomatoes are easy to make, but it takes a while for them to shrivel in the oven and become all jammy and concentrated. I suggest making them ahead of time – they can sit at room temp until you’re ready to assemble the salad. When you come home… have a glass of wine, check your email… do anything besides stare at the oven waiting for your tomatoes. They’ll be done in no time and your kitchen will smell amazing. 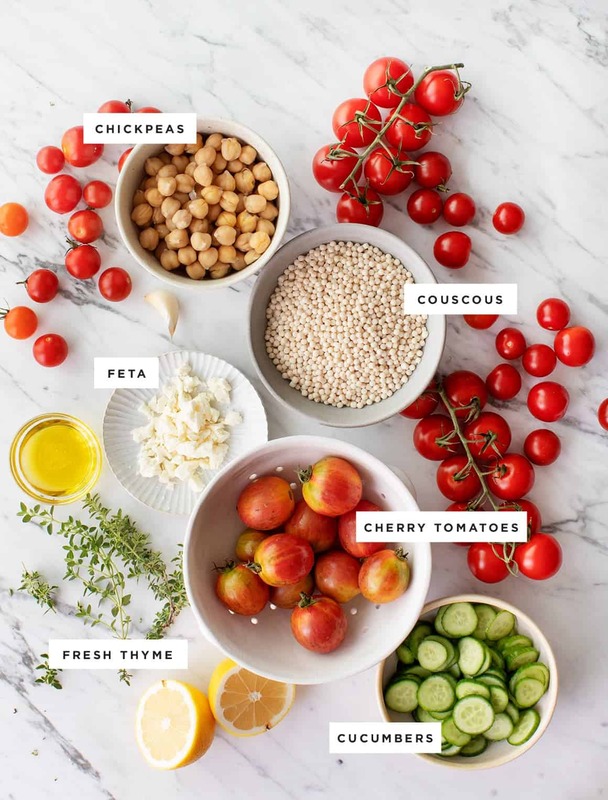 Once your tomatoes and roasted chickpeas are ready, toss everything together in a big bowl. Top with an abundance of fresh herbs and a generous drizzle of olive oil. 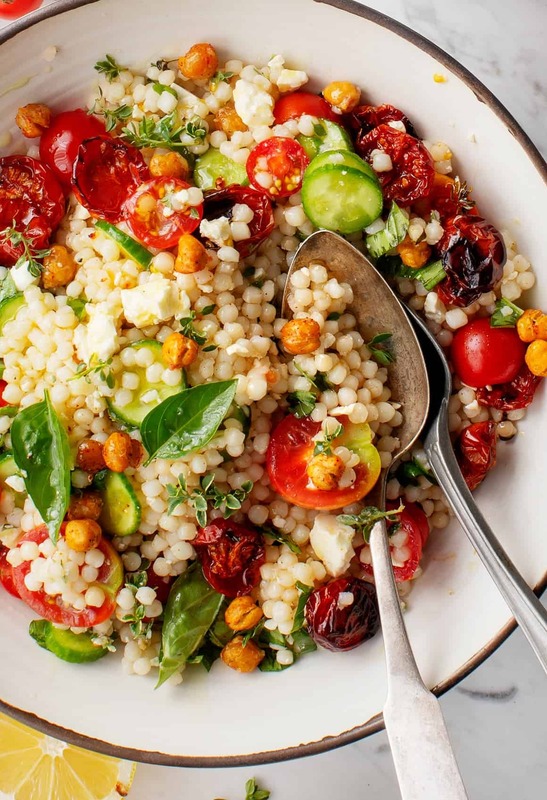 Serve this couscous salad with a protein if you like, or just on its own (chickpeas = protein). For more tomato salad ideas, try these favorites! This sounds absolutely scrumptious. 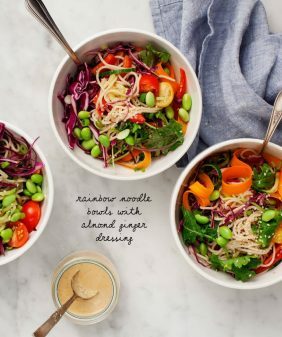 I am adding this to my list of vegetarian lunch dishes (I can get away with vegetarian meals better at lunch than dinner). Really looking forward to trying it. I just made this and it is fantastic! 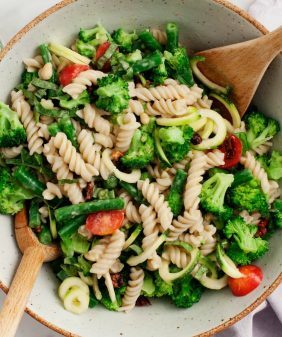 I was searching for something light & easy to make for dinner & this was perfect! Followed the recipe exactly & turned out fantastic! I just love your blog! Hi Kristina, I’m so glad you loved it!! I made this as written and it was delicious! Hi Claire, I’m so glad you liked it! Thanks for coming back to let me know! I made this last night and we absolutely love it! 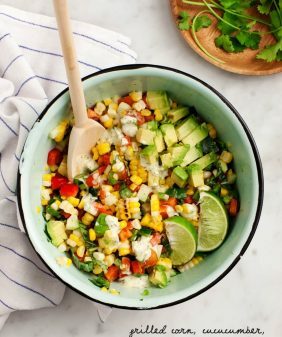 Very delicious ingredients and layered flavors! The only thing I changed was the basil, which I did not have so I added chopped fresh mint. Excellent recipe. Hi Rena, ooh, I bet mint was delicious. I’m so glad you loved it – thanks for coming back to let me know! Made this last night. So delicious! I added some broiled asparagus too. Seriously, I love every single one of your recipes. Just a tip–I’ve had great luck growing herbs year-round with an aerogarden! A great recipe. 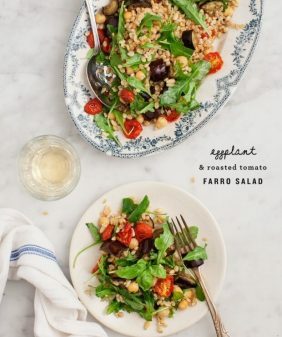 I am amazed at how roasting the tomatoes in the oven brings out the sweetness in them (wow) it really adds another dimension to this salad. Next time I’ll plan ahead so that I have time to oven roast my chickpeas. Is it best to rinse the couscous after cooking it so it doesn’t clump together? That was an issue for me. Hi Claudia, I’m so glad you loved it with the roasted tomatoes! You can rinse the couscous or, better yet, toss it with a drizzle of olive oil to keep it from sticking together. I usually find that it un-clumps once I toss it in the bowl with the dressing if I just break it apart with a spatula before adding everything else. Hope that helps! This was absolutely delicious, even better than I thought it would be. I was concerned that the amount of dressing was small for the amount of salad, but it worked out perfectly and I didn’t end up having that situation where there is a lake of dressing at the bottom of the bowl. Thanks for a fantastic recipe. I can’t eat dairy. Any substitutions for feta? Hi Cheryl, just leave out the feta and add a little extra salt, to taste. Hope that helps! I’ve made this every week since you posted the recipe and it’s become an absolute favorite in our home. Wonderful flavors and so satisfying but doesn’t leave you feeling heavy. Really love it the next day, as well. We added some roasted asparagus for a little more bite and it was great. Ooh, I’m so happy it’s become part of the rotation, I LOVE hearing that :). Mmm, asparagus sounds delicious! Absolutely love this salad . So yummy. Hi Paulette, I’m so glad to hear!